Like many northeastern cities, large and small, that flourished during the Industrial Revolution, Salem is still wearing the scars of its productive past: there are decaying tanneries, free-standing chimneys, and ramshackle warehouses in close proximity to more beautiful (and lively) places around town. I think these sites are simply part of the layered texture of the city, and of course a century or more ago their builders would never associate the word “scar” with these constructions: they were industrial palaces. 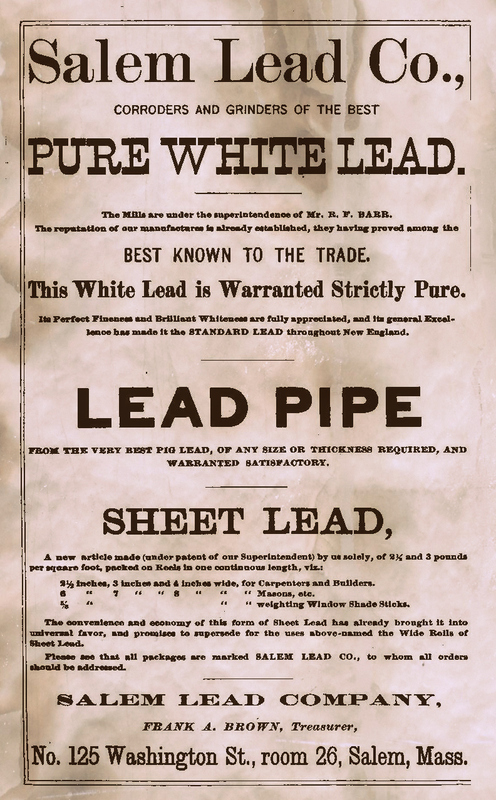 I’ve been thinking about lead mills recently, as there is a large site on the Salem-Marblehead line that is the subject of a planning study right now. The buildings of the Forest River/ Chadwick Lead Mills sat on this site (originally known as “Throgmorton Cove”) for nearly 150 years, producing bullets for Union soldiers, and “pure” white lead for generations of painters. The company received authorization to fill in the Forest River in three separate occasions in the later nineteenth and early twentieth centuries, creating the landscape that had to be cleaned up a century later, after its almost-landmark building burned to the ground in 1968. An earlier–palatial and pastoral–incarnation of the company is represented by a F.F. 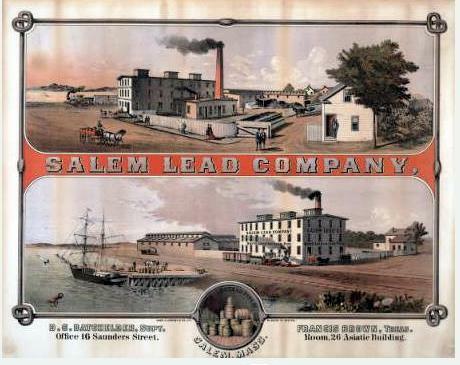 Oakley chromolithograph in the collection of the Boston Athenaeum, along with a similar image of its competitor across town, the Salem Lead Works. I do think it is interesting how nineteenth-century printmakers portrayed industrial buildings not as encroaching on the landscape, but as part of it. Boston Athenaeum chromolithographs: F.F. 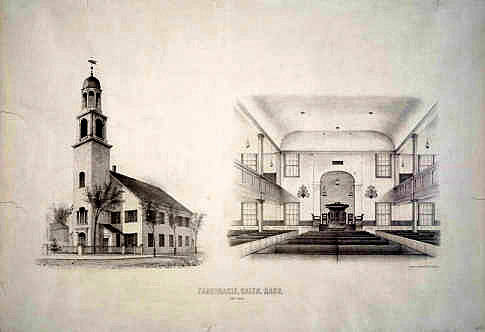 Oakley Litho., 1860; Chas. H. Crosby & Co. 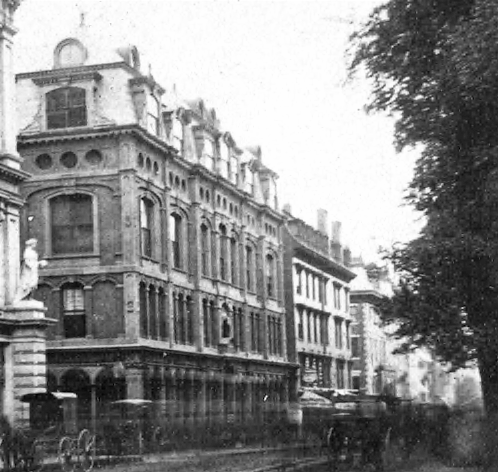 Lith., 1872, both Boston. 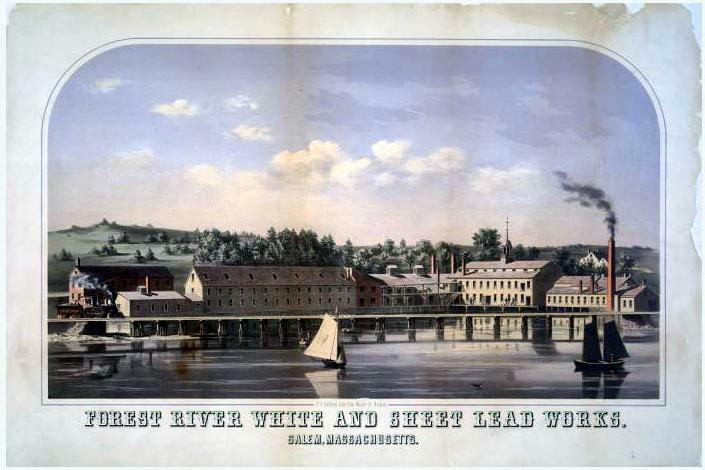 Nothing survives of this second Lead works, which was situated on the North River along the train tracks–as you can see in the lithograph, except for little scraps of paper which advertised its products, which of course necessitated a century-long (and more) deleading process pursued not only by cities, but also individual property-owners. 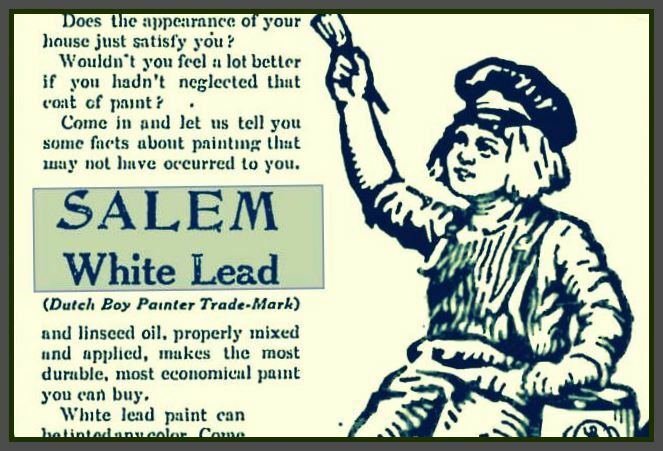 Forest River Lead Company logos from a 1919 billhead; Salem Lead Company ad from the 1886 Salem Directory; 1930s Dutch Boy ad featuring “Salem White Lead”. 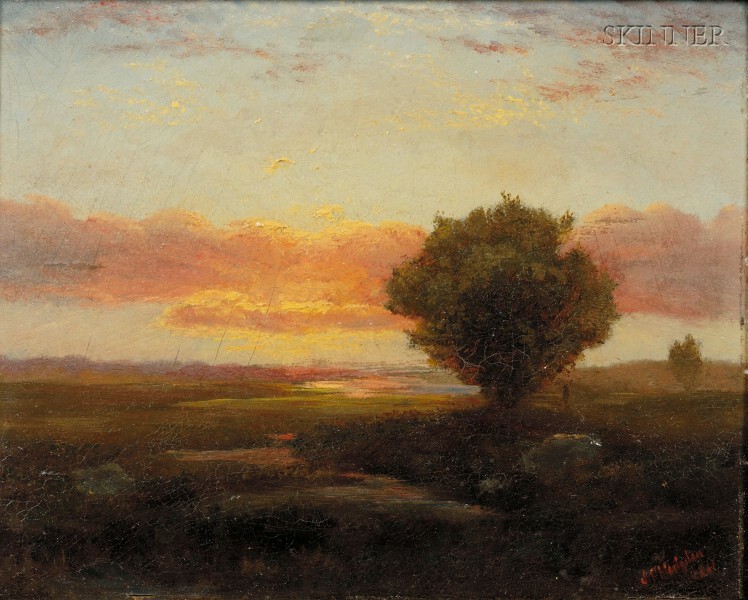 Last week, I discovered yet another Salem-born artist of the mid- and later nineteenth century in the usual way–by browsing through auction archives (a relatively new pastime of mine that I’ve got to nip in the bud, as it is very time-consuming!) This particular artist, Sylvester Phelps Hodgdon (1830-1906) did not dwell in Salem in his adulthood, but I continue to be amazed at the creative environment that existed in this era, another aspect of Salem’s history that is overwhelmed by its Witch City reputation. 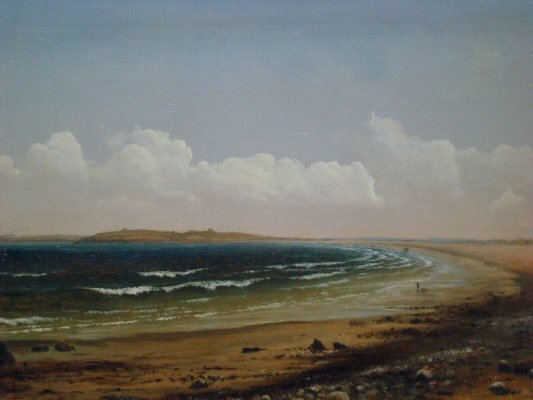 Hodgdon was the son of a wealthy Salem currier who had married into one of Salem’s older families, which explains the prominent Phelps in his name (although he usually signed his paintings “S.P. Hodgdon”). He appears to have moved to Boston in his early 20s, where he studied with the well-traveled Boston artist Benjamin Champney and worked for the L.H. Bradford lithography firm. For most of his life, he lived in the Dorchester section of Boston, and maintained a studio at the Tremont Studio building downtown, along with a host of prominent artists and architects. He was clearly part of the Boston art scene and community, teaching classes and exhibiting his work at the Boston Art Club in its heyday. But like so many Boston-based artists of this era, Hodgdon was drawn to northern New England for his subject matter: there are few streetscapes among his works, but rather gilded landscapes of marshes, valleys, and mountains–predominately in New Hampshire. 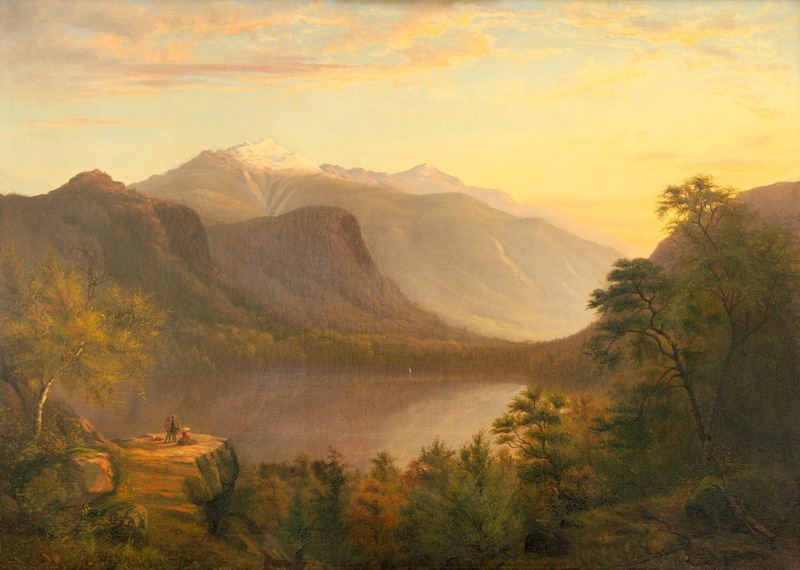 Therefore he is generally characterized as one of the “White Mountain Painters”, along with Champney, who created one of America’s first art colonies by inviting a succession of painters, including Hodgdon, to come to his summer residence in North Conway from the 1850s on. This was clearly Hodgdon’s preferred milieu, but I did manage to find a few local scenes among his digitized works. On the Marsh/A Salem, Massachusetts landscape,1861, Skinner Auctions Archive; Long Beach, Nahant, 1861, Carlsen Gallery Auctions Archive; Echo Lake, Franconia Notch, 1858, Collection of John J. and Joan R. Henderson. Photograph courtesy of the New Hampshire Historical Society. All the sources indicate that Hodgdon preferred to work at the “extremes” of the day, in the early morning and at dusk. This last painting is among the most acclaimed of his White Mountains works, and as you can see, it dates from early in his career, while he was still in his 20s and working as a lithographer by day/artist by night (and summer). I was able to gather a few other images to add some context to Hodgdon’s life, including some examples of his lithography for the Bradford firm and a photograph of the Tremont Studio building in Boston: all traces of his past that are now sadly gone. Hodgdon’s lithographs for L.H. 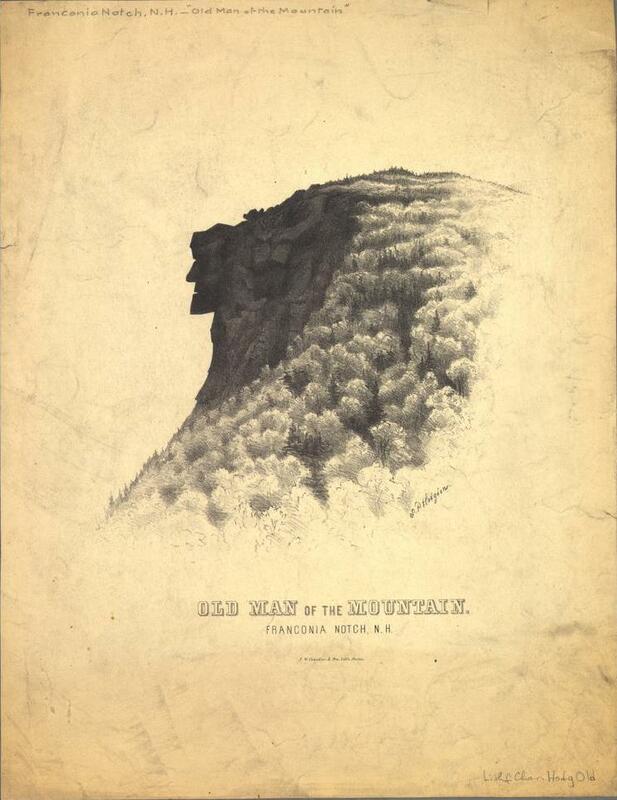 Bradford: “Old Man on the Mountain”, Franconia Notch (whose visage crumbled to the ground in 2003) American Antiquarian Society; Tabernacle Church, Salem, 1854, Boston Athenaeum, and the Tremont Studio in Boston, New York Public Library: gone, gone & gone.